Completely Remodeled - Summer 2010! This is a 2 bedroom two bath condo in one of the best buildings in the Old Town section of Puerto Vallarta (called Zona Romantica). Our condo is an elegant non-smoking unit in Plaza Mar Condominiums. Full time management, housekeeping and front desk staff. From the large terrace across the full width of the condo on the fourth floor, you overlook the Pacific Ocean and the activity on along the most popular beach in the city. Our condo features a new kitchen with granite counter tops, an island with double sinks and bar, new refrigerator, stove and microwave. Designer accent lighting has been installed through out the kitchen, living room, dining room, and terrace to allow you to set the evening mood to your liking. The living room and west suite face the ocean and both have wood and glass panel folding wood doors to open up your space to the ocean breeze. The spacious terrace invites you to relax and enjoy the view, gather with friends to toast the sunsets, or enjoy the calming breezes and the sounds of the surf in the evening. Each bathroom has a large modern shower featuring a standard shower and a bench with a detachable shower head. Granite counter tops with undermount sinks, new lighting and ceiling fans create a very comfortable place to freshen up from your day's activities and prepare for your evenings out. On the rooftop, away from the crowds, you can lounge on a secluded deck by the swimming pool. At night, when it's time to sleep, the cool ocean breeze will sweep through your unit as you rest comfortably on king-size mattresses. PlazaMar is not a timeshare or a hotel. There is no walk-in traffic or large travel groups checking in at midnight. The building is a friendly place where owners and their guests love to gather at the roof top pool and exchange experiences and tips on where to eat, shop, and fish. Use the roof top BBQ for your own private BBQ with friends. Coordinate groups with other units in the building. Plazamar in the Zona Romantica is walking distance to some of the best restaurants in Puerto Vallarta and the finest art galleries around. Puerto Vallarta is one of the safest and loveliest towns in all of Mexico. Sorry, we do not allow small children. The owners are from Seattle, Wa. 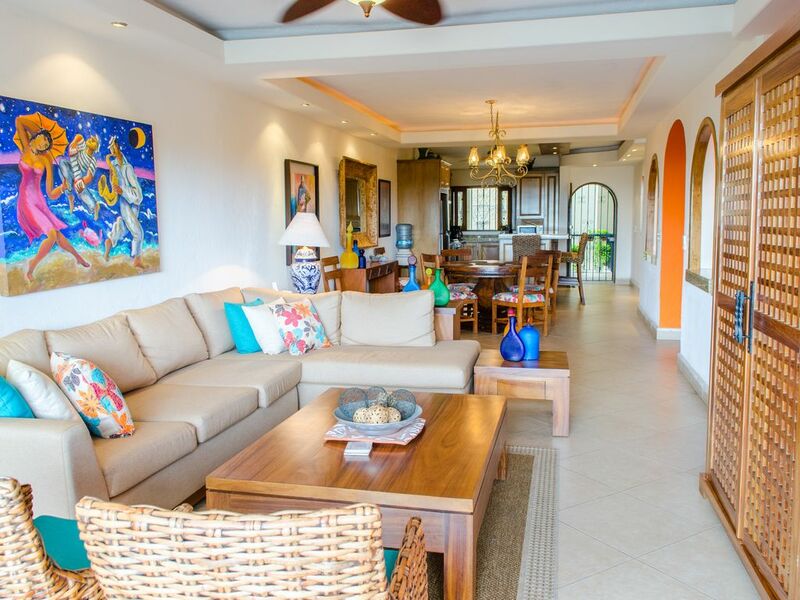 This is a finely furnished condo owned by a couple that fell in love with Puerto Vallarta and its people many years ago. The ocean, the art, the fabulous food, it is our home away from home. We hope that you will love it as much as we do. If your tired of the resort scene, you will love this location. You have privacy, comfort and a great location. Some of the best dining in Puerto Vallarta is available within a 5 minute walk from our condo. If you like art, one of the best gallaries in Puerto Vallarta, Galleria Dante, is 3 blocks away. The beach is beautiful and the fishing is great. Remodeled. Has a standard shower head and a bench with an additional hand-held shower wand. See the ocean, palm trees, beach and beautiful sunsets. We also have pool towels! Shared, top floor in community area. Bath and beach towels provided. Save room in your suitcase and use our beach towels. Repeaters allow for a great signal in the unit. New living room furniture installed in 2015, lounge around, watch TV or listen to music. Its all there. Coffee maker, coffee press, coffee filters. All the dishes and utensils you need are there. Blender, coffee maker, coffee press, mixing bowls, juice squeezer, etc. Everything you need. New Dining table for 6. 32" Flat screen TV in the living room. Our guests leave books to share with you. Look in the lower area of the credenza. Looks out on the ocean. Has a new roundtop table, 4 chairs and a lounger. Large deck in the unit overlooks the beach, also a large area on the roof top with gas grill and pool. Roof top pool with views and a refrigerator.